Android L, the upcoming operating system by Google Inc. (NASDAQ:GOOG), is being called the most dramatic user-interface overhaul since Android 4.0 Ice Cream Sandwich, which was released in 2011. Though Google likely won’t share the majority of details about the new system until it's released, there's already a considerable amount of information about Android L available. When will Android L release? Google has stated that Android L will be available to the public in the fall, but the Mountain View, California, company has not divulged specific launch dates. However, previous Android versions have released between October and November. Android 4.4 KitKat, for example, was announced on Oct. 31 of last year. What changes can users expect with Android L? Google previewed a number of Android L features at its I/O conference last Wednesday, including: details about the new user interface called “Material Design,” which is inspired by the look of paper and ink; the system’s new “Heads Up” notifications, which pop up on top of active applications without disrupting the activity; its updated “Recents” feature, which now displays recently visited Web pages in addition to recently used applications; and its battery-life optimization called “Project Volta.” However, those are just a few features that users can look forward to in Android L. Android Authority has details on a number of small features that greatly improve the Android user's experience. With Project Volta, users can find out how long it would take for their device’s battery to charge in full. A notification displays on the device’s lock screen when it is plugged in for charging. Additionally, users can access the information at Settings> Battery. Users can also find in their Battery settings how long it would take for their battery to drain. Users can set up a “Do Not Disturb” mode on Android L, which silences all notifications for a set time. The feature can be enabled by pressing a volume key and selecting the Do Not disturb icon, to the left of the volume control. Additionally, the feature can be accessed through Quick Settings panel and the advanced settings at Settings > Sound & Notifications > Do Not Disturb. Users can now find a search option within settings by selecting the magnifying glass search icon to find their way around. By accessing Settings> Accessibility> Color Space Correction, users can set up the display on their Android L-powered device according to various levels of color-blindness. There are six modes, each addressing a different variation of color-blindness: Deuteranomaly (red-green), Protanaomaly (red-green), Tritanomaly (blue-yellow), Deuteranopia (green), Protanopia (red), Tritanopia (blue), Deuteranomaly (red-green). With the new “Heads Up” notifications feature, Google has made it easier for users to control which notifications pop up. Users can access Sound & Notifications> Showing Notifications > App Notifications to turn notifications for different apps off or on. Which devices will receive Android L? Not many devices are confirmed to receive Android L at this point, but release details for a few devices have already been announced. Google unveiled its Android One smartphone at I/O, noting that the high-quality budget device will receive automatic updates directly from Google, just like Nexus devices and Google Play Edition phones. This indicates that the Android One will be among the first devices to receive the Android L update upon its release. Additionally, Taiwanese manufacturer HTC Corp. (TPE:2498) has announced that its flagship handsets such as the HTC One M8 and the HTC One M7 will update to Android L within 90 days of HTC receiving the final system software from Google. Currently, Google has made the Android L developer preview software available for many of its own Nexus-brand devices, including the Nexus 5 smartphone and the Nexus 7 (2013) tablet. How can users get Android L now? 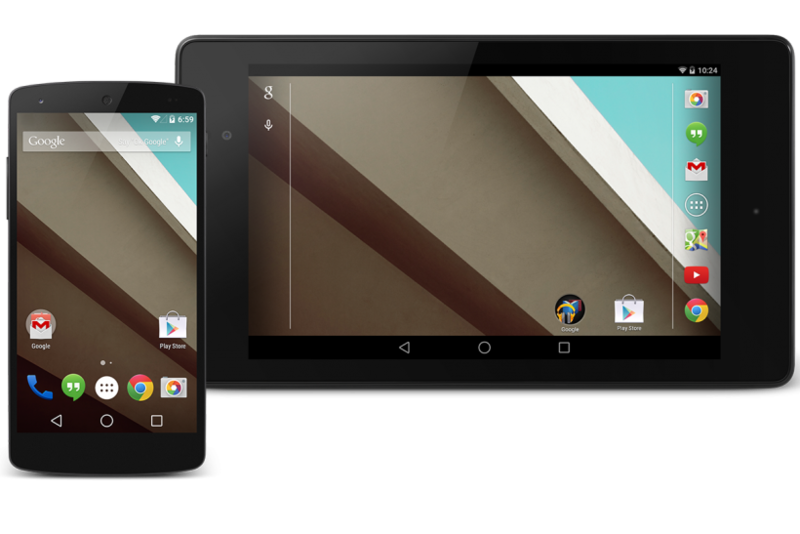 As noted, the Android L developer preview software is currently available for the Nexus and Nexus 7; however, as an unofficial release, the developers' preview contains many features that do not work well yet. It is recommended that only those experienced with unstable software attempt to install the Android L developer preview. More important, users should not attempt to install the preview on devices other than the Nexus 5 or the Nexus 7. Currently, users can test out a few Android L features that developers have made available on the Play Store, including the Android L keyboard, the Android L wallpapers and the Heads Up notifications. While many of these are not precise Android L features, they can give users a hint of the look and feel of the upcoming operating system. What are experts saying about Android L? Many developers and other experts have been experimenting with Android L since its developer debut. There have been many positive opinions, but many say they're holding their critique until Android L is officially released. Tech website Ars Technica in particular performed a battery life test on a device running Android L and has determined that the new software made the device’s battery 36 percent more efficient than its previous operating system, Android 4.4.4 KitKat. The Project Volta battery optimization on Android L uses several methods to extend battery life, including its updated battery-saving mode, which can add up to 90 minutes of life of a dying battery. At the least, users can hope to avoid the battery brain issues that have plagued older versions of Android.